Feed Pre-Starter from 5 to 8 weeks of age. This feed continues to supply the high nutrient density essential for early rapid growth. Feed Pig Starter from 8 weeks of age until pigs are about 75 lbs. in weight, (about 12 weeks of age). This will provide the needed nutrition and also aid in. 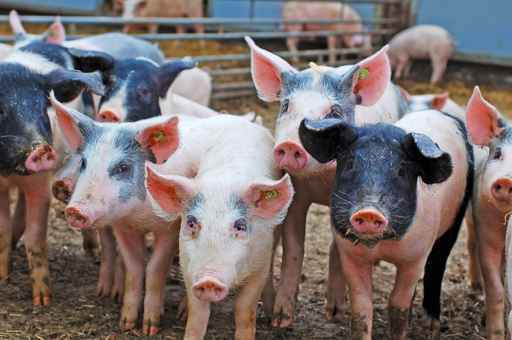 the prevention of worm infections and swine dysentery. Pig Grower contains 16% protein, and is fortified with minerals and vitamins. It includes an antibiotic to aid in prevention of dysentery. It is designed to be fed from 75-125 lbs. in weight. This feed should be fed from 125 lbs. until market. It is formulated to produce both rapid gains and the quality carcass so essential for peak profits. This supplement may be blended with your home raised grains to provide a balanced ration for your hogs during the growing and finishing periods. This 14% protein ration is formulated to obtain optimum embryonic growth and to meet the nutritional needs of the bred sow and gilt. We recommend feeding from 4-5 lbs. per head per day according to the individual animal's condition. Lactation Ration is designed to provide for the nutritional demands of the lactating sow. This feed contains 16% protein, added fat, minerals, and vitamins. It is formulated for maximum milk production, and minimum loss of body condition. This feed is formulated to be a source of concentrated protein, minerals and vitamins. It is designed to be blended with grain to provide balanced rations which meet the demanding nutritional needs of the swine breeding herd. Feed intake should be increased by about 1 lb. ( day approximately 4 weeks before farrowing. This provides some additional nutrition for the rapidly developing pigs. About two thirds of the baby pig's birth weight develops during the last month of gestation. Full feed sows during lactation and until they have been re-bred. This aids the sow in producing an adequate supply of milk for the growing pigs. Providing adequate levels of protein and energy is also important to achieve good fertility and high conception rates during rebreeding. Limit feed to 4 - 5 lbs./head/day during gestation. It is desirable to control weight gains to 40 - 50 lbs. for sows, and 80 - 90 lbs. for gilts. Energy restriction during gestation increases embryo survival.